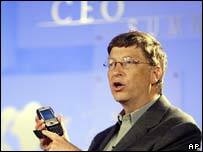 Blogs are good for business, Microsoft chairman Bill Gates has said. He said blogs had advantages over other, older ways of communicating such as e-mail and websites. More than 700 Microsoft employees are already using blogs to keep people up to date with their projects. Mr Gates' blessing of blogs came during his keynote speech at Microsoft's CEO Summit held on the company's campus in Redmond, Seattle. The speech was a canter through many of the forthcoming technological developments Mr Gates and Microsoft believe business bosses should know about. The speech covered mobile phones, new wireless technologies, RFID, digital cameras and broadband, as well as all the uses such things can be put to. Mr Gates made a point of dwelling on blogs and said that although they started in the technical community and have come to be a broader social phenomenon, businesses can use them too. They had advantages over more traditional ways of keeping in touch such as e-mail and websites, he said. E-mail messages could be too imposing or miss out key people who should be included, said Mr Gates. These problems could be solved, said Mr Gates, by using blogs and Really Simple Syndication (RSS), that lets people know when a favourite journal is updated. "What blogging and these notifications are about is that you make it very easy to communicate," he said. "The ultimate idea is that you should get the information you want when you want it." 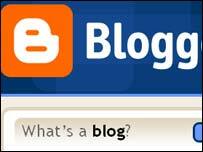 Many Microsoft employees have already embraced blogging and more than 700 people at the company maintain blogs. Most Microsoft blogs are about development projects for new and old products, some are aimed at academics and students and others are more personal. Microsoft currently does not make any individual blogging tools but it is widely expected to move into this space soon. If it does the move would pitch it into even sharper competition with Google and others such as AOL.